Expect More Arizona is a statewide nonprofit, nonpartisan education advocacy organization working to ensure every child receives an excellent education every step of the way. 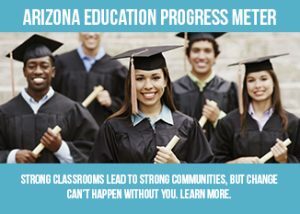 With a growing network of 270 partner organizations and more than 80,000 individuals, Expect More Arizona provides information about important education issues and creates opportunities for people to take action – in their home, community and statewide. The organization also brings people and organizations together to support policies that positively impact students and teachers. As Arizonans, we want our state to be a great place to live, work and raise a family. A strong education system doesn’t just benefit students, it improves the quality of life for everyone. The world is changing rapidly every day. The jobs our children will have may not even exist today. To strengthen the economy and prepare for the future, we need to give all children an education that helps them become critical thinkers, problem solvers and life-long learners, from their earliest years through their first jobs and beyond. A world-class education gives every child in Arizona the tools to succeed in school and in life, regardless of background, income or zip code. The path to excellence requires students who are motivated and ready to learn, involved parents, trained and committed educators, informed and engaged voters, and capable and supportive elected officials. In other words, it takes all of us.